Kelbros Inc. provides quality turning & machining at competitive prices - one part or multiple, interchangeable cavities, small core pins or large cavity blocks. 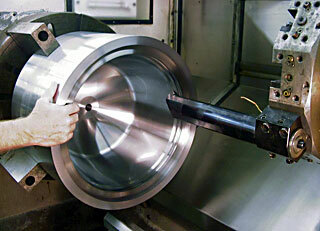 Our CNC turning capabilities extend to 32" diameter x 60" long. Internal quality control procedures, CAD/CAM, and CNC machines are utilized, providing the highest quality product. We can assist in your design and trouble shooting needs when machining electrodes & mold components. Competitive pricing & worldwide delivery service are standard. Look to Kelbros Inc. for all of your custom mold components.